The poetry collection Hyperborea, by our longstanding contributor Milorad Pejić, was awarded a newly established prize “Slovo Makovo – Mak Dizdar” for the best poetic work published last year in the Bosnian, Montenegrin, Croatian, and Serbian language. The Prize was established at the initiative of Dr. Alija Behmen, Mayor of the City of Sarajevo, and was a result of the cooperation of the Writers’ Association of B&H, the City of Sarajevo, the PEN Center in B&H, and the Mak Dizdar Foundation. This prestigious prize was handed to the poet on November 23, 2012, at the National Theater, at the joint ceremonial session of the Assembly of the Sarajevo Canton, the City Council, the WWII Veterans’ Association of B&H, and of the councils of cantonal municipalities held on the occasion of marking of Bosnia and Herzegovina’s Statehood Day. Milorad Pejić was born in Tuzla in 1960; he studied in Sarajevo, and since the summer of 1992 he has lived in Sweden. He entered the literary scene with his book The Vase for the Lily Plant (Sarajevo, Svjetlost, 1985), which met with great success both among readers and literary critics. His second book, The Eyes of Keyholes, was published bilingually, in Bosnian and German, by Bosanska riječ (Tuzla–Wupertal, 2001; second, revised edition, 2012). His latest collection, Hyperborea, awarded “Slovo Makovo,” was released in Bosnian by the Prague publisher Aula in 2011. 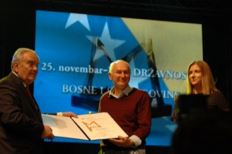 In accordance with our editorial credo and our intention to continue and intensify our efforts in articulating and supporting non-nationalist understanding of fundamental cultural, ethical, and social determinants of Bosnia as a historical entity, the Editorial Board of Duh Bosne welcomes and supports the founding of the “Slovo Makovo – Mak Dizdar” Award and sends their hearty congratulations to the first laureate of the Prize, Milorad Pejić. As our New Year gift to our readers, we publish three new poems by Pejić in this issue.